Hammacher Schlemmer have always been an authority figure on oddball gadgets, well now they’ve got one more to add to your collection. 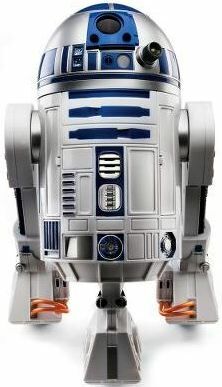 This 15” tall R2 is voice activated and will respond to all kinds of voice commands. Actually he responds to over forty different voice commands, which is tragically a much larger amount than my supposedly smart dog. I wonder if I could swap them R2 for a tubby little pug, at least the bot would make far less of a mess. R2 can even be set to a motion sensor so that he sounds an alarm when he senses movement. My dog just licks the intruder to death, at least R2 would startle them. R2 also can follow you around and swivel his head around. He can mimic happy and sad sounds and even has an occasional “bad mood” which can be remedied with an “R2 behave yourself.” He can also replay sounds and dialog from Star Wars. He’s also a dancer, he dances along with the cantina music. If you’re worried about a troubling question just ask R2 and he can answer with a yes or no. To pick one up it will cost you $169.95.